Spayed female 40-pound cream chow with reddish ears lost Thursday, April 26, 2007 in Franciscan Country Club area of Daly City, CA (peninsula south of San Francisco). Dog had just been placed. Extremely shy but non-aggressive, loves dogs. Everyone is heartbroken - dog had a very, very rough life (neglect case) culminating in abandonment in SPCA parking lot, then fostered and made over, adopted out to wonderful home, then accidentally lost. Please, please help if you can. REWARD. Call either 650-994-1564, 415-522-3566 or e-mail jdonaldson@sfspca.org. Please cross-post to anyone in San Francisco peninsula/Daly City area. Does she have a chip? Have you alerted the gold course itself? They should keep an eye out for her...there are lots of place to hide there. Jenn - where exactly is the Country Club? ChowTeam - what name is she answering by? And, have you contacted the PHS/SPCA (Peninsula Humane Society) since she was lost in their jurisdiction and if someone finds her they will probably contact the PHS? Yes, she's micro-chipped (and wearing a collar and ID tag) and her name is Buttercup. The adopted mom is on the Peninsula lost dog filing and poster patrol (I've been on newspaper ad etc. duty). She's so shy I fear she'd bolt from anyone and could even elude animal control officers if she wasn't cornered. We were out canvassing today and there is a ton of green space with the golf course and the state park there. It's a quiet gated community where the adopter, a lovely retired lady (who has one chow already) lives. We are all overwrought. Thanks so much. could we have a photo of Buttercup? And, the name of the last place she was seen. State, township, zip code? Are there fliers up in the area she was last seen? Contact the shelter where she came from and urge them to get involved. Has anyone gone to look? We could do more to help, if the above answers are provided. Sounds alot like when Molly went missing. She to was scared, going to a new home when she got loose, and would never in a million years go to a stranger. The end results from the help of the people on this board was Molly was found and is safe now in her new home. I have faith that they can help find this lost Chow to. Bama, there is a photo of her in "Community Discussions" under a separate thread. I wonder if I can copy & paste one of the picutes... Let me try. If I fail, do look at the other thread. Irony of ironies.... I can help with locating a chow in Illinois, but a chow that was lost 2 miles from me???? Maybe we can also do some sort of cc.org prayer tree that our chows in the happy hunting ground lead this little one safely to Miss Pooh Bear's house! We drove up to that area right before the sunset. What a perfect place for a chow, who wants to stay hidden, get lost... Oh my gosh! There is a mountain preserve less than 10 yards from where Buttercup was lost, a golf course 50 feet to its South, then homes and schools right across the street to its north and unfortunately a very busy street to the west. There are also cemetaries all over in the neighboring township. PB and I drove through the closest one before heading home. I spoke to Jean... she works for the SFSPCA (if anyone was following the Azlan/Blueberry needs a home thread, that's where she works) and was fostering Buttercup. 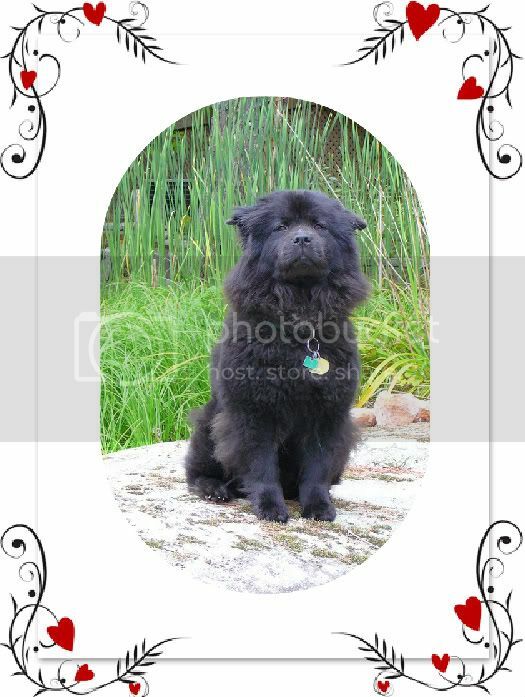 Buttercup was an abused chow that was literally "dumped" on the front door of the SPCA. Jean, who also has another chow, fostered Buttercup to health and beauty. As Sweetpea mentions, yes, very similiar to Molly's situation, Buttercup is in her new home and no sooner did her new owners let her into her backyard did Buttercup wiggle her way out of the complex through balusters that separated the "country club" and the outside world. So please, everyone help pray this little one stays safe and will be found. Meanwhile, Jean, there were no posters anywhere I drove around to. There should be posters on all of the telephone poles so the residents can help if they have a siting. Also, the guard at the complex knew nothing about Buttercup. There should also be a poster there too. He wouldn't even let me walk through. The two schools, the dementia residence, the cemetaries and the energy company that hosts the towers adjacent to the complex should be notified as well with a poster at least, and the Colma Police Department. It is very dark now and I hope she did not venture into the mountain preserve. It's known for coyotes and home of feral dogs that have been dumped there. Then there is a pathway that can lead the little one to Highway 101, way on the opposite side of where she was lost, also less than 2 miles away. I'm checking petharbor.com every few hours. Lou, if someone hasn't already done so, maybe a posting in the Pets and the Lost & Found sections of Craig's List would help. No news. I'll be delivering a stack of fliers to PHS, police stations and cab companies this afternoon after, an idea a friend gave me. She was last seen on the Cypress golf course near Franciscan blvd. in Daly City, CA 94014. Fliers are up and there have been sporadic search parties since she bolted the evening of Thursday, April 26. She came from San Francisco Animal Care and Control, who have also been notified. She's on Craig's List, the SF Chronicle in print (coming out Monday - the earliest they can publish) and online (already up - thank heavens) and San Mateo county newspaper, also in print and online. I'm about to try to upload photos to the gallery. Thanks to you all for the support. Buttercup is an incredibly nice dog - her personality is like her pictures. Jean, don't forget the fire houses in South City. It sounds like she's traveling that away. As well as restaurants and even the casino since that is open 24/7 and a sighting of a cream chow could happen in the middle of the night. I hope she heads towards the homes and not toward the freeway. Oh, and the junk yard! Plus a flier at the South City BART station could be useful and Tera Bay Park. Is SFSPCA or ACC scheduled to go on any morning or mid-morning news show for a "perfect pet" segment? If so, perhaps you can ask the representative to also bring info on Buttercup so they can give an alert. Those segments usually don't air after 10am Saturday (I think KRON sneaks one here and there) during the weekends. But at least for Monday, if she hasn't come home yet, the more exposure the better. Pooh Bear and I will go out after lunch for another drive around the areas. I'll try to go into the Chinese, Japanese and Korean cemetaries... sorta scared, but will do it for Buttercup. Often their culture leave food offerings gravesite. Maybe she's been noshing there in the evenings. Last edited by Zhuyos mom on Sat Apr 28, 2007 11:06 am, edited 1 time in total. Honestly, which way does the wind usually blow? Check the weather reports if needed to get that information. She will most likely go up wind, toward the aroma of food. So, if there is a restaurant pumping out the smell of food, she will check them out. She will also need water, therefore check out the waterhole on the golf course. Look at a map for any water sources in the mountain park. She likes dogs! Take a dog with you to look. She is much more likely to show herself if there is another dog present. I hope we find Buttercup. Ironically, Molly the last furkid lost shares her name with my little furkid, Molly. Now, Buttercup is missing...I have a furkid by the name of Princess Buttercup. ....Hmmm? That is very ironic Bama!! Very strange... Good luck finding this precious baby! I think upwind where she is would take her to the Ocean. At least she's in Graigslist, In the bay area Graigslist is way more populer then any of the other area's. some one has have to of seen her. I've been searching around San Mateo county, including the Peninsula Humane Society. As of 3:20 pm CST I have not located Buttercup. Link to several Shelters some near, some not so near. Since I don't know the area, and you do...would you please select the links that you feel are in play here? Unfortunately, I have to sign off until much later this evening. Oh darn it, I wish I could continue searching tonight! If there are several shelters involved, possibly you guys can divide them up and search? Jeff is great with the Craig's List and has that covered...You're the Man! Jenn has been searching Pet Harbor...go girl! I'll check in with you guys later. "Jeff is great with the Craig's List and has that covered...You're the Man!" They posted in craigslist not me, I was just saying that the people in the bay area use craigslist alot so maybe that will help. Boy what a difference in the bay area shelters then the rest of the US, bay area shelters almost look human and on top of it believe in animal rights. there's a picture of a vet with a chow on the opening page of the SF shelter. Not the missing Chow. Buttercup was sighted on the Cypress golf course yesterday afternoon - once up on a hill next to the driving range around a pond that is there and then around the 6th and 7th holes. I was just on my way there and a call came in from a woman who just said "Serramonte," which I checked and is a street that ends at the golf course, but is a pretty main looking boulevard. Oh I hope you can find her and get her to come to you. I know many people are praying for her on this list and many have asked the chows at the bridge to look out for her. Could she possibly walking to Miss PB's house? She just has to take a left and then a right and there we are Buttercup! PB and I just got back, literally got back from canvassing that area for two and a half hours. I gave a couple of flyers out. My dentist just happen to be at the golf course and I gave him flyers to post at the club house. I'm really hoping the lead was not a hoax. When I returned from the 2 hour romp, I opened up the site and saw the latest lead, got PB back into the car and drove to the beginning of the street and all the way down to the end of the street. I hope news is good. On a cute note, when we were canvassing the area, you know how I always say to use inflection when trying to ask your chow to do anything? Well, I was calling "Buttercup" after 3 whistles (which is PB's far away come to mommy sound), and guess who else would follow with saying in her chownese "Buttercup". It was hilarious! I used different inflections each time and she did too. Such a goofy chow that Pooh Bear! Bama, thanks for helping out. If your hubby has flow out of SFO, he would be very familiar with the mountain range Buttercup is lost in... it's the San Bruno Mountain and pilots know it as sign hill. It's the annoying mountain that all the airplanes need to make sure they are high enough to clear. Jeff, I think the photo you are refering to is Jean herself. I'm not sure though. She'll have to clarify it. She's the resident behaviorist at the SFSPCA. She also has a chow she adopted from there. Leo's Mum, thanks for the page and for forwarding the lead on to me. BTW, I'm going to stay in my neck of the woods for the rest of the evening. Brownie delivery will be tomorrow. So, let's cross our fingers and do a little prayer that my boy is guiding this little one safe to his baby sister's house and out of harms way. I just went back and read it, yeah its Jean, I was looking at some other stuff when I first went on the site and saw the picture so thought it was a vet and Chow.